So you’re contemplating or are already on a natural fertility program – eating really well, trying herbs and supplements, exercising daily, staying vigilant about tracking ovulation, etc. This is all great! But are you taking care of your mind? Are you telling yourself you’re fertile, that your body is strong and can heal? 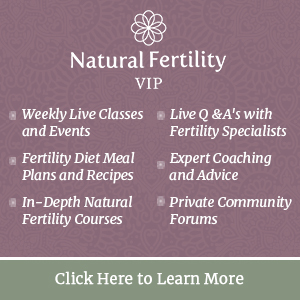 Do you believe you can achieve your fertility health goals? Do you use mind-body therapies? Science is proving you should be! Mind and body therapies (sometimes referred to cognitive-behavioral therapies) are techniques used to address both the health of the mind and body through psychological, social, behavioral and spiritual approaches. They include various practices that invite the participant to slow down, be calm, breathe deeply, sit quietly, log off from stimulus, observe the body, thoughts and feelings, or channel/change their thoughts from negative to positive. “Studies show that visualization can help alter menstrual cycles and imagery can boost your immunity. Danish researchers found increased natural killer cell activity among ten college students who imagined their immune systems were becoming very effective,” shares Joanne Verkuilen creator of Circle+Bloom Mind-Body Programs, a collection of brilliantly guided meditations. Mindfulness may significantly reduce levels of pain, as well as lower anxiety and depression for patients with chronic pain according to classic research from John Kabat Zinn, internationally-known and revered founder of MBSR (mindfulness-based stress reduction). Mindfulness can help reduce the severity of the symptoms of premenstrual syndrome or PMS (according to researchers at Seattle Pacific University and the University of Washington, Seattle). Cognitive-behavioral therapies have proven time and again to reduce psychological distress for couples in treatment for infertility and improved clinical pregnancy rates, report Danish researchers who conducted a meta-analysis of reports/studies published in several databases between 1978 and 2014. Mindfulness-based intervention is able to positively impact “fertility quality of life, mindfulness, self-compassion, meaning-based coping strategies” and pregnancy rates for women going through in vitro fertilization (IVF) for the first time, learned researchers and developers of a program called the Mindfulness-Based Intervention for IVF (MBII) at the Third Military Medical University in Chongqing, China. Is your mind set on being fertile? If you need the science as proof, researchers continue to conduct randomized control trials, analyze possible mechanisms that might explain why mindfulness helps, explore the impact of mindfulness on the brain (its physical structure and function), and summarize the research with systematic reviews and meta-analyses of published studies. Psst! I bet though, that if you just give a mind-body therapy a try and feel the changes in your mood and body, you won’t need to know science says there’s proof that they work.